A professional 600W transformer for small- to medium-sized systems - accommodates very long (or heavily loaded) wire runs! Multi-Tap 12-22V - for very long wire runs! VOLT® 12-22v Landscape Lighting Transformers feature top-of-the-line internal and external components for professional results and commercial reliability. Truly the perfect solution for medium to large landscape lighting systems - especially those with very long (or heavily loaded) wire runs. Only draws as much electricity as needed to illuminate the bulbs you have -- e.g. a 1200w transformer will only draw 400w of power if you only have 400 watts of bulbs hooked to it. Guidelines suggest never loading the transformer to more than 80% of capacity (480 watts for this model). The choice of whether or not to use a toroidal core also depends the system load. Systems with relatively high loads - such as lighting systems with 10 or more fixtures, benefit the most from toroidal cores; smaller systems - such as those with less than 50 watts of load, are served well with EI laminated types. This is why VOLT® sells its smallest transformer (75 watt capacity) with an EI core. This transformer type converts the 120 volt current to 12 volts by first increasing the frequency of the current (from 60 Hz to as high as 20,000 Hz). The increased frequency allows the use of a miniature core enabling the transformer to be very small, light, and inexpensive. The biggest downside is that their high frequency current may not be compatible with LED circuits. These currents also suffer from extensive voltage loss compared to magnetic types. 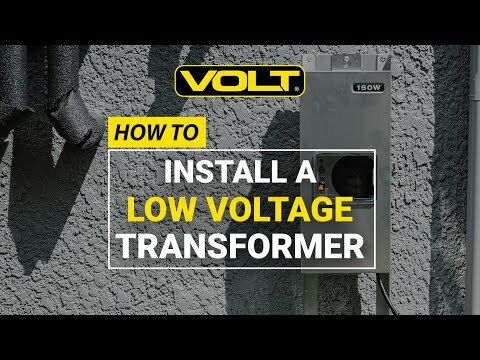 A 12-volt electronic transformer must be positioned within about 10 ft. of the fixture. Electronic transformers are also subject to overheating and premature failure. For all these reasons, VOLT® only uses electronic transformers for indoor lights such as under-cabinet and strip lighting.